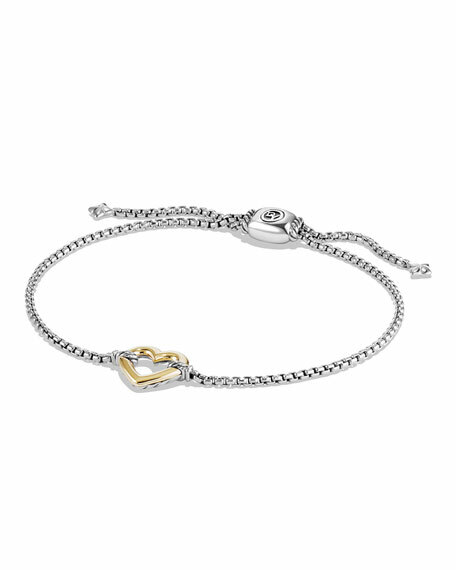 David Yurman bracelet from the Valentine Hearts Collection. Heart-shaped 14-karat yellow gold center station. DAVID YURMAN bracelet from the Renaissance Collection. Sterling silver cable cuff. 14-karat yellow gold stations. Pink tourmaline and rhodolite garnet. DAVID YURMAN bracelet from the Renaissance Collection. Sterling silver cable cuff. 14-karat yellow gold stations. Pink tourmaline and rhodolite garnet. Approx. 0.2" (5mm) wide. Made in the USA. David Yurman bracelet from the Renaissance Collection. Sterling silver. Pavé diamond end caps. 0.22 total diamond carat weight. Slip-on style. David Yurman bracelet from the Renaissance Collection. Sterling silver. Pavé diamond end caps. 0.22 total diamond carat weight. Slip-on style. Width, approx. 0.2" (5mm). Imported. From the Oval Link Collection. Sterling silver bracelet. Hidden hinge clasp. Wrist size large. 8.25"L; 12mm width.